Gosh, I supported ANOTHER Kickstarter!? After writing a book about game design ("Game Design", McFarland, 2012), I've been spending a lot of time creating online audiovisual classes, as that seems to be where people want to go to learn. This survey at Surveymonkey will guide where I go next. (It has already helped me decide which talks to give at GenCon.) The details are in the survey. Tom Vasel interviewed me for episode #27 of Boardgame University. Download the MP3 at http://boardgameuniversity.libsyn.com/ I had no idea what he was going to ask me, so my answers are entirely off-the-cuff. Corey Young @C_M_Young says on twitter, "BEST episode yet!" Jeff Patino @osohombre says "and it was one of the most engaging BGUs!" So I must have done something right. Go to metacritic.com and pick a few movies, some with a good overall score, some with poor scores. Rather than read the few "up front" review excerpts, read all of them for these games. Notice how, almost always, there are professional reviewers who hate a movie with a good score, or those who like a movie with a bad score. Only the most extreme movies get no really extreme score opposite the majority. This is what it's like when you design a game. You might think it's "the best game ever", but that doesn't matter; the majority of game players will NOT like your game, will NOT want to play it, and some will think it's an awful game. That's the nature of creative effort. What you need, of course, is for most people *in your target market* to like your game. Even then, some won't, but if most do, you're in good shape . . .
Also remember that people often don't buy games because the games are good for them to play, but for other reasons. Here's a strong indication that, despite the focus of many nuts-and-bolts wargamers on data - S&T magazine style - in the end it's about the game. That indication is, we have lots of games about battles that we have NO CLUE about, such as Tours (Charles Martel and the Moors) and Catalaunian Fields ("Romans" against Attila). And there's so many more we have next to no information about, such as Hastings. But people still buy and play the games. From http://www.jim-butcher.com/jim, website of the author of the Dresden Files (which is very cinematic, quite unbelievable, and very entertaining). "Jim goes by the moniker Longshot in a number of online locales. He came by this name in the early 1990's when he decided he would become a published author. Usually only 3 in 1000 who make such an attempt actually manage to become published; of those, only 1 in 10 make enough money to call it a living." Probably those numbers are from pre-electronic publishing POD days. When you had to sell to an actual publisher. I think similar numbers may apply for game designers these days, which is why self-publishing is so common. I don't know where Butcher got his numbers from, unfortunately. Second, you must submit what you write. Third, you must never rewrite except to editorial prescription. Fourth, you must continue doing this until you are successful. One of the fears the author of a non-fiction book may have is that it will become dated, or worse, that he'll find himself disagreeing with his own work. A foolish consistency is the hobgoblin of little minds, of course, but you don't want to feel that TOO much has changed. I have little interest in deck-building games because they have little to no "correspondence" to reality, - they're not models of anything, essentially abstract and mostly puzzle. At least, that's absolutely true of Dominion, though I heard an interesting comment recently, that when you build a deck in Dominion then you're done, you don't do anything with what you've built, while with some other deck-building games you build the deck, then use it for another purpose. Perhaps out of the hundreds of deck-building games, there are some that are models, though the entire deck-building structure is, to me, obviously abstract. "Fantastic course, Dr. Pulsipher. I'm in school for Game Dev (which, of course, does involve programming), and while my last instructor is a veteran in the field, the textbook didn't emphasize the required aptitude for Game Design. This one nails it without sugarcoating it." As I now have a suitably cheap Android device I've been able to try the free Britannia application available on Google Play. (I was unaware of during its development.) It's evidently a practice program that is far from finished. The computer opponent is an idiot, not surprisingly. I found it very difficult when using the Romans to invade to figure out how many Romans were in a particular area, and I also found that the Belgae don't submit. The Welsh went crazy and after their first turn the occupied only two areas. And I saw Brigantes attacking Picts and Picts attacking Hebrides 1 to 1. You also cannot choose the order of battles, the computer does that for you. 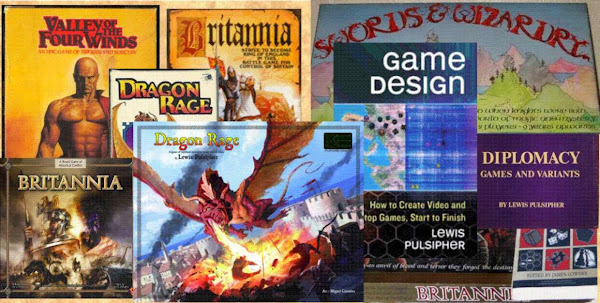 My book-length audio visual course "Learning Game Design" now open. $10 off coupon ($39 instead of $49): https://www.udemy.com/learning-game-design/?couponCode=LGD%2410off 30 day money-back guarantee. After writing a book about game design ("Game Design", McFarland, 2012), I've been spending a lot of time creating online audiovisual classes, as that seems to be where people want to go to learn. This survey at Surveymonkey will guide where I go next. The details are in the survey. Another very interesting Kickstarter: "gripmats" that keep tiles, cards, and other game objects in place on tables. Great idea.